How to find out which Facebook categories have been assigned to you. If we didn’t know before, we’ve certainly learned very recently that Facebook knows a whole lot about us. But today I discovered that they’re assigning us to marketing categories, which are chosen based on the data gathered from your Facebook activity. No surprise here: they inform which ads you’ll see as you scroll through your news feed to see your friends’ cute baby pictures. So, here’s how to find your categories. And how to update them, so you can actually see ads that are relevant to you. Or just to mess with Facebook a little bit. Ha. Related: Should you quit Facebook? We’ve got the resources you need in order to decide. The first step is finding your category assignments. They’re located in your settings. This is how I got there on my desktop: Settings > Ads > Your Information > Your Categories (tab). There you’ll see a wide range of categories, from controversial (like, your political bent) to very mundane (like, which month your birthday is in). You can click the X next to that category to remove it completely, but you can’t change them. (On your mobile device, you can choose a smiling or frowning face to show if you agree with the category. (Frowning removes it completely). People are kind of freaking out about the political categories (which was wrong, for me), but I found some other info here much more interesting-slash-alarming. For example, under the Advertisers I’ve Interacted With tab, you can see a list of companies that have your contact info. For me: AirBnB and AT&T (my cell phone provider) have my info, okay. But, why in the world does Auto Zone or “Amazing Tech Crowdfunding” have my contact info? Related: Here’s how to check which 3rd-party apps are connected to your Facebook account. There’s a complicated way to remove yourself from these interest-based advertising lists, which involves visiting the Digital Advertising Alliance. 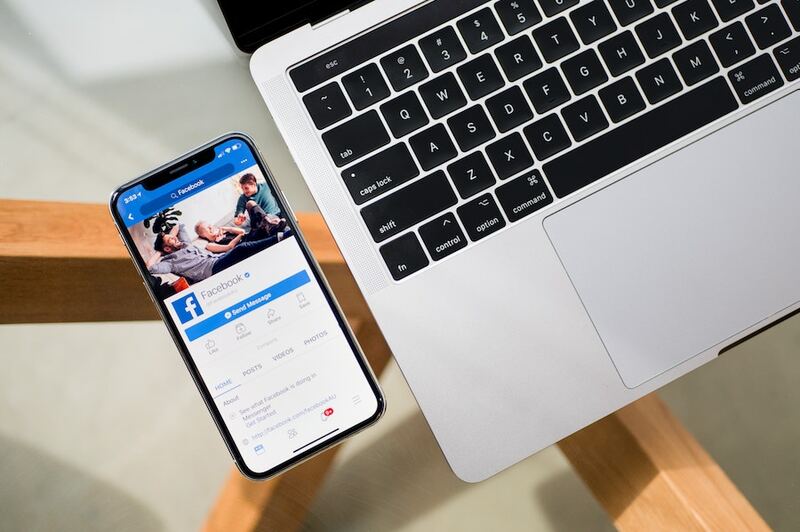 They’ll help you go through the process of changing your settings so that your browsing history isn’t shared with marketers. The upside: no Big Brother watching what you do online. The downside: you’ll still see ads, they just may not be as relevant to you any more. An option that might be appealing: Hide Ad Topics. 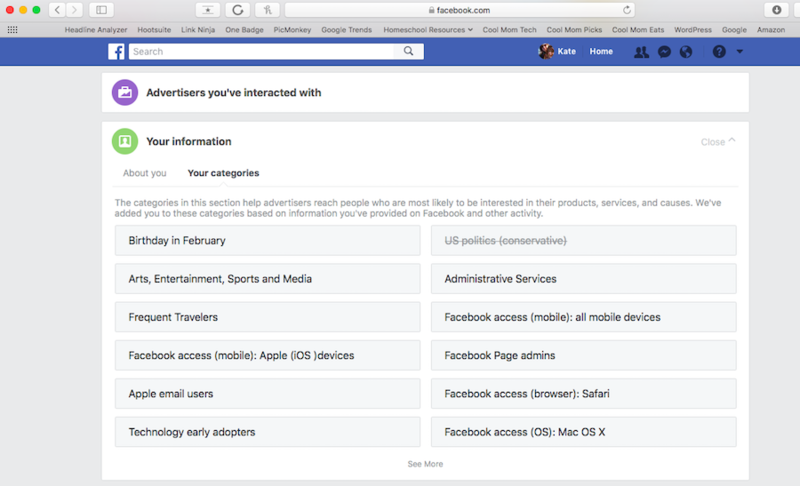 In this section, you can choose to not see ads for a period of time (6 months, 1 year) which might be what you need to get you through election season or any other short-term period of time that makes you fall out of love with Facebook. Or, you can choose to permanently hide an advertising topic altogether. One more box I’ll be ticking while I’m here is the Ads with Your Social Actions tab, where I can choose the option to let “No One” or “Only My Friends” see which ads I’ve engaged with online. While I don’t feel that I have a lot of secrets to hide, I’m still planning to check the “No One” option here. Because no, my entire friend feed doesn’t need to know that I clicked through on an ad for, well, anything, really. And I don’t want them to think I’m endorsing a product by interacting with it. Besides, I’d much rather them read about it on Cool Mom Picks.